(Newser) – The first part is an interesting enough tale: A guy hunting pythons in the Everglades instead finds a piece of gold jewelry that might be from one of two old plane crashes. 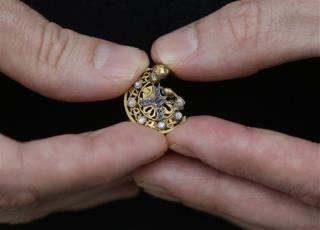 But the best part of the story in the Miami Herald is that Mark Rubinstein says he will not keep the pendant. If he can't track down a relative of the owner, Rubinstein will donate it to a museum or the Archdiocese of Miami. "It was part of a situation that caused so much sorrow," he says. The idea of keeping anything like that is just wrong. I'm glad he thought it through. This man has a lot of class. I hope he is rewarded some how later in life. Its very heartwarming to hear that there are still good people with integrity and morals left in the world.